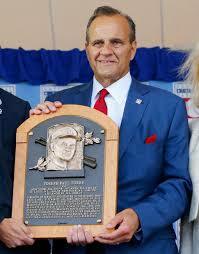 July 28, 2014 - Joe Torre, ASA Lifetime Member and four-time World Series Champion as manager of the New York Yankees, was inducted into the National Baseball Hall of Fame during the 75th annual induction ceremony in Cooperstown, NY. Torre spent his playing days with the Milwaukee and Atlanta Braves, St. Louis Cardinals and New York Mets, and managed the Mets, Braves, Cardinals, NY Yankees and LA Dodgers. Of all his accolades, including being the only man to amass more than 2,000 hits (2,342) and win more than 2,000 games as a manager, Torre made it clear during his acceptance speech what got him to Cooperstown. "I'll cut to the chase: I'm here because of the New York Yankees, " Torre said. His accomplishments in the Bronx speak for themselves: 10 division titles, six AL pennants and four World Series triumphs in 12 years, as he helped restore the luster to baseball's most successful franchise and resurrected his own career after three firings. Also receiving kudos from Torre during his 28 minutes at the podium were Yankees closer and future Hall of Famer Mariano Rivera, pitching coach Mel Stottlemyre, and longtime bench coach and confidant, the late Don Zimmer. "Don Zimmer, aside from costing me a lot of money by introducing me to horse racing, eight years sitting next to me made me into the manager I turned into," Torre said. Friends and former coaches Willie Randolph, Jose Cardenal and Lee Mazilli even made the trek to Cooperstown to support Torre in person. One blemish on Torre’s perfect day was that he felt he didn’t give enough praise to George Steinbrenner and the Steinbrenner family. Torre did thank "The Boss" for taking a chance and hiring him as manager in 1996, but he still made a point of addressing the situation at the post-ceremony press conference before taking any questions. "I missed mentioning and thanking the most obvious guy in the world when you talk about the Yankees," Torre said. "I mean, I mentioned George, but I didn't give him what my plan was, to just thank him and the fact that we had a great relationship. It was so obvious that I was going to do it that I went right past it -- the whole Steinbrenner family as well. It's the proudest time in my whole career and I just feel terrible that I omitted that."